The Hubble telescope captured a star’s explosion four times over. In a nod to Einstein, it used the natural lensing effect created by the gravitational pull of galaxies to probe the edges of the observable universe, where no normal telescope can reach. This marks the first time ever a distant star explosion has been observed four times over. "It's a wonderful discovery," Alex Filippenko, professor of astronomy at UC Berkeley in California says. “We’ve been searching for a strongly lensed supernova for 50 years… Besides being really cool, it should provide a lot of astrophysically important information,” Berkeley cites the astronomer as saying. "The four supernova images captured by Hubble appeared within a few days or weeks of each other and we found them after they had appeared," Steve Rodney of Johns Hopkins University, USA, leader of the Frontier Fields Supernova team, said in another press release. The supernova, at 9.3 billion light years away, was captured thanks to a cluster of galaxies that sits just between us and the explosion. Together with a massive galaxy at the center, they bend and magnified the light in between. The object was christened by scientists as SN Refsdal, after Sjur Refsdal, the Norwegian who pioneered gravitational lensing studies. In 2009, they observed that the cluster, 5 billion light years away, gave off incredibly clear images of a spiral galaxy, so took note. The current image of the supernova is created by the ‘red galaxy’ at the center. Because it is inside the cluster, its effects are combined with those of the surrounding lenses, so there’s “a double lensing effect,” according to Patrick Kelly of Berkeley, who first observed the supernova on November 10, while studying Hubble photos of the area. According to Einstein’s General Theory of Relativity, great concentrations of mass can bend light as though it were a lens. This magnifies distant objects as though they were hundreds of times closer. The first such lens was discovered in 1979. 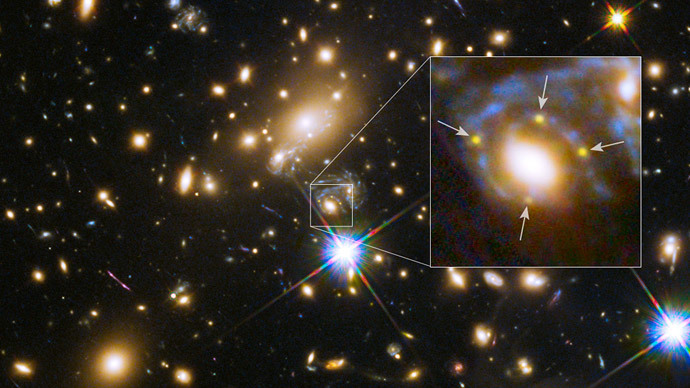 "These gravitational lenses are like a natural magnifying glass. It's like having a much bigger telescope," Kelly explains. "We can get magnifications of up to 100 times by looking through these galaxy clusters," he added. "It was predicted 50 years ago that a supernova could be gravitationally lensed like this, but it's taken a long time for someone to find an example," he also told Space.com. But what allowed the Australian and American scientists on the project to make the photograph four times over? The images each appeared separately over several weeks because during lensing, light bends and takes various paths and different times to reach those paths. Gravity warps the fabric of reality. The greater the mass of the object, the more lensing will occur, because of its greater effect on gravity. Light is then also bent like a lens. The difference is in the strength of the lens. When the object is far from the gravitationally lensing mass, or if its area is not especially large, ‘weak lensing’ takes place. But when these conditions are reversed, the light from the object comes from almost directly behind the source of that gravitational lens. This leads to ‘strong lensing’ and explains why the image was captured four times. When a lens is close to a large object, its image can get smeared into a so-called ‘Einstein ring’ when observed through the lens. However, what we have in this case is an ‘Einstein cross’ – when distant objects that appear smaller are combined with strong lensing. With the super-bright quasars, it’s practically the same thing as looking at a lit match through a piece of crystal. 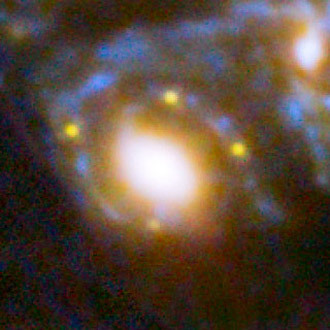 Multiple images are produced that surround the gravitational lensing mass. The sky is filled with these lenses. The trouble is finding and using them to our advantage. According to Filippenko, the bonus here is that astronomers can set their clocks to observe supernova replays. One will occur within the next decade. A computer model of the observed cluster shows that scientists missed one opportunity 50 years ago, another, 10 years ago. Opportunity will knock again, but will depend on how the gravitational pull of the galaxy cluster behaves. Scientists need to capture precise moments when everything is aligned for best results. But they would not be spending millions of dollars on useless research, so the point here is what this quadruple image of the SN Refsdal can tell us. We can measure the arrival of good lensing opportunities and, as a result, map how ordinary, visible matter and dark matter interact within the confines of the galaxy cluster. This will provide invaluable insights, according to Kelly and Filippenko. Knowing the behavior of the incredibly mysterious dark matter will enable us to measure the rate at which the universe is expanding – one of the biggest questions in astrophysics. There are already ways to do this, but they’re all subject to “heated debate,” according to Kelly.